Driven by Michael Ellul, Ut De Dompierre won yesterday’s major event at the Marsa Racetrack. This was the Malta Racing Club’s 150th Anniversary Grand Final for class Premier trotters on a short distance of 2140m. This race formed part of the 8th meeting of the season made up of twelve races all for trotters. Yesterday’s card included also three semifinals from the Assikura Championship for class Bronze trotters also on a short distance of 2140m. Nine trotters lined up for the class Premier Grand Final. Lajos Cella (Redent Magro) was the fastest horse at first, opening a small lead from Ultra De Vindecy (Clifferty Calleja) and Ut De Dompierre (Michael Ellul). However with 300m to go, Lajos Cella started to slow down and was overtaken by Ut De Dompierre which took its first win of the year from Ugo Des Jacquots (Mario Fenech) and I Won’t Dance (Clint Vassallo). Lajos Cella had to settle for fourth place from Ultra De Vindecy (Clifferty Calleja). At the end of this final, Ms Denise Bonello, on behalf of the sponsors, Nespresso, presented the winning trophy to the owners Alfred and Stephen Ciangura and driver of the winning horse Michael Ellul. This in the presence of MRC Chairman Edwin Borg. The winner clocked an impressive time of 1.13.3” per kilometer. From the three class Bronze semifinals, twelve horses made it to the final stage. In the first semi final, Tinus Moseby (Marco Refalo) registered its second win in a row from Skip Dimanche (Joshua Azzopardi) after starting to increase its speed with a lap to go. Swedish Dollydoo Laday (Rodney Gatt) also took its second consecutive win from Italian Job (Marco Debono) in the second semifinal after sprinting well in the final straight. The Way (Clint Vassallo), was outsmarted by the winner, Italian Plutonio (Clifferty Calleja) few metres from the finishing line. Un Roi d’Atout (Andrew Farrugia) and Urido d’Alban (Mario Fenech) ended respectively in third and fourth place. For Plutonio this was its first win in Malta. Jaguar Broline (Redent Magro) dashed strongly from the outside during the last 300m of the second class Premier event. This Swedish thirteen year old trotter sealed its first win of the season from Uno Dancer (Clint Vassallo), French newcomer Upman (Noel Baldacchino) and American debutante Appomattox (Mark Bonnici). 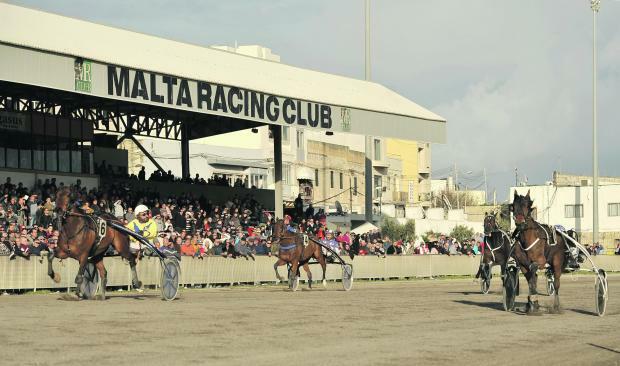 Another meeting at the Marsa Racetrack will be held on Saturday. The first race should start at 1.30pm.